France105 leFH18B2•More rounded at round parts, but otherwise the same. •The sides for the hull gun mount are now 60mm (+20mm). •The driver’s hatch no longer sticks out. •Armor behind the tracks is now a very sloped section and a flat section, instead of a single slightly sloped section. Verdict: Not enough to matter. AMX 50 Foch (155)•20mm sideskirts have disappeared. •Mantlet front buffed to 310mm from 250mm. •Mantlet sides are slightly thinner, with the rear half being 60mm. A new weakspot, but probably would mean much. •Indent on mantlet mount roof for the baby periscope is now 200mm thick where it would normally be a tiny flat 100mm weakspot. •Flat front of mantlet mount is 200mm instead of 180, side of the mount are 170mm instead of 180mm. •MG tumor shaped changed to more like a sphere. 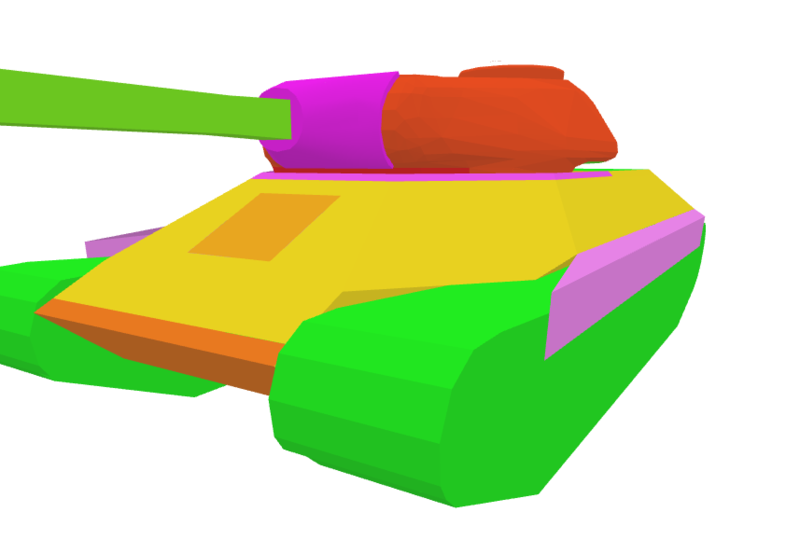 Front armor is mostly 175mm thick instead of 180mm-80mm, but the sides become 40mm much sooner. •”Hammerhead” tumor is now armored just like the AMX AC mle 48, just with the the very base of it being 180mm instead of 130mm. •LFP is now 62°, was 59°. UFP is now 55°, was 54°-56°. •Spare tracks create a 50mm zone near the rear of the side hull (+10mm). Verdict: I’ve not played this, but the mantlet area at least looks tougher from the front. Side skirts maybe helped against HEAT? E-25•Spare tracks create a 35mm area on side hull (+5mm). •Driver window no longer protrudes from the front plate. •Top of mantlet mount is 20mm now (-30mm). •Inside walls on the mantlet housing nerfed to 30mm (-20mm). • Armor hole behind mantlet replaced by another piece of 60mm spaced armor. •Mantlet shape changed and lost the 10mm spaced armor tube around the gun behind the mantlet. •I hope people don’t whine over what looks like a lot of nerfs in their head. G.W. Tiger•Hull MG weakspot removed. •Fighting compartment nerfed to 5mm (-11mm). •Some changes to front hull slope. Nothing that changes anything. Nashorn•Spare tracks create a 35mm zone on LFP (+5mm). •Driver hatch is now 10mm from all directions (-20mm front, -10mm side). •Sloped rear floor plate same thickness as the rest of the floor (-5mm). Verdict: Never had armor, and never will. Pz.Kpfw. T-25•UFP no longer has 45mm protruding hatches and MG mounts. •All MG ports and optics are as thick as their surrounding armor (buff). •Hull side behind tracks is 50mm (+5mm). •Spare tracks create 55mm zone on upper hull side (+10mm). •Hull rear is 35mm (+15mm). •Rear hull sloped plates can now autobounce 75mm ammo (+5mm). •Hull and turret roof/floor are now both 20mm (+10mm). •One cupola removed, the other shrunk and got thicker sides (+25mm). •Armor hole behind mantlet taller, possibly slimmer too. •No bumps on either side of the turret armor behind mantlet. •Turret ring is 60mm and even smaller (+25mm). •LFP is 45° instead of 53°, rear hull slope is 40° instead of 51°. Nothing else changed much. Verdict: Mantlet might be a tiny bit worse and the tank taller, but the armor is certainly better. VK 30.01 (H)•Stock mantlet no longer is thinner near the edge. •Stock turret cupola is no longer stupidly tall (why was it tall in the first place). •Stock turret has smaller armor hole behind mantlet. •Top turret face no longer has 120mm zones. •Top turret cupola is no longer stupidly tall (why was it tall in the first place). •Top turret now has a 80mm turret ring, but not one too big. •Top mantlet 40mm edges are now much smaller. Verdict: Top turret face may be a bit weaker, but the cupola is now a whole lot less vulnerable, as it should be. Lowe•Like the E-25, mantlet shape is more like a cone and less like a tornado. •Armor hole behind mantlet at least appears smaller. 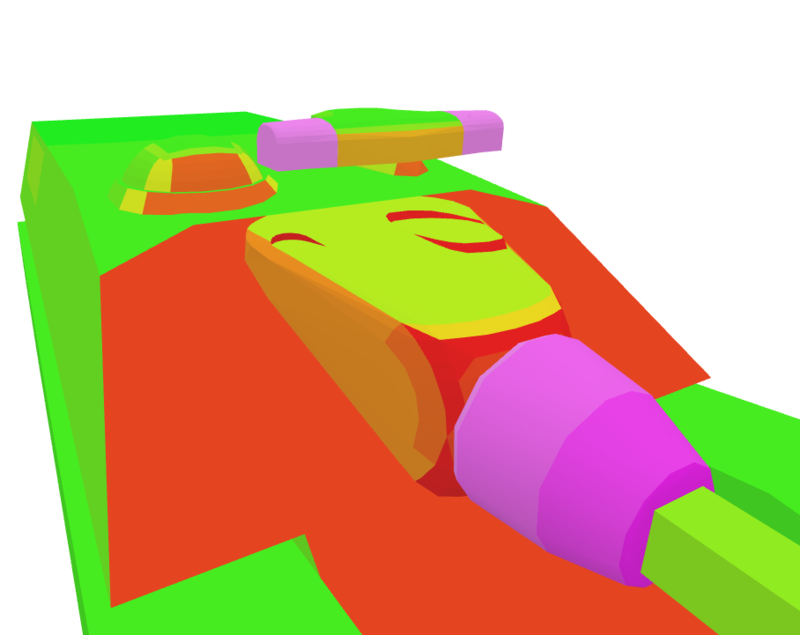 •A bit more flat front turret face at the edge of mantlet (nothing to aim at, but might get penned by some tier 10s on accident). •Hatches on turret roof the same as the rest of the roof (+10mm). •Turret ring roof area along the side and rear hull now has the turret fully over it (thanks, extra polygons!). •200mm turret armor covers a bit more ground. •120mm turret rear now covers a bit more ground too, but nothing to complain about. •Cupola is no longer topped with a 70mm cone. •Rear lower plate is 33° instead of 31°. Verdict: Nothing huge. 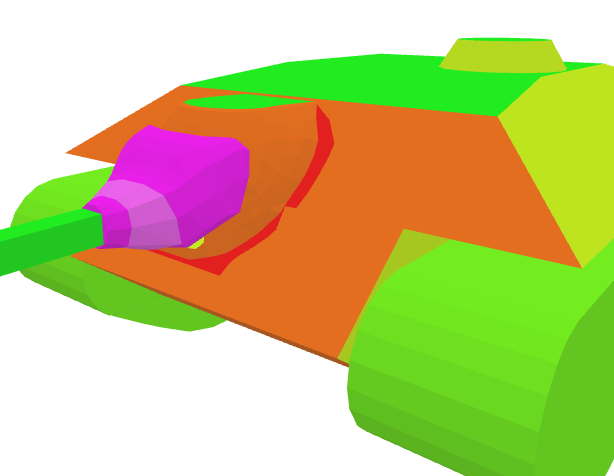 Mantlet area seems a bit worse, but there’s also more bit area covered by 200mm instead of 160mm. Front hull is unchanged. Type 5 Ke-ho•Lost those protrusions on the hull for the front wheel. Great Britain Crusader•UFP nerfed to 20mm (-12mm), LFP nerfed to 20mm (-2mm), beak buffed to 32.7mm (+12.7mm). •Areas respectively angled 63°(was 65°), 28° (was 30°), 62° (was 64°). •Driver’s front is now 40mm (+8mm). •Hull roof was 14mm, is now 9mm-4mm (and 12mm over driver). •Stock turret ring is 24.7mm all around (was 39mm frontal, 19mm side, 23.5mm rear). •Minor tweaks to stock turret side and rear armor, new 14mm spot on turret rear. •Round stuff is more round. This tank has a lot of round stuff. Lower 228.6mm strip is rounded now instead of flat. Verdict: Mantlet is better for certain, other stuff is mostly minor buffs. USA M53/55•Turret face is simplified (no mantlet, just flatness). •Front hull shape also slightly changed. Lots of minor changes. T1 Heavy•Sides of bump on stock turret roof are 63.5mm (+38.5mm). •Small 35mm box on stock turret roof removed. •Stock turret bottom rear slopes are 63.5mm and 50.8mm (-19.5mm and -32.2mm). •Front turret face is entirely 102mm, no more 82mm strip around the edges. •UFP no longer has a bump for the MG housing or the thinner areas for MGs and vision slits. •UFP slope increased from ~22° to ~30°. •Sloped middle plate angle increased from ~60° to 60°-74°. •Rounded front hull is 95.3mm-76.2mm instead of 102mm. 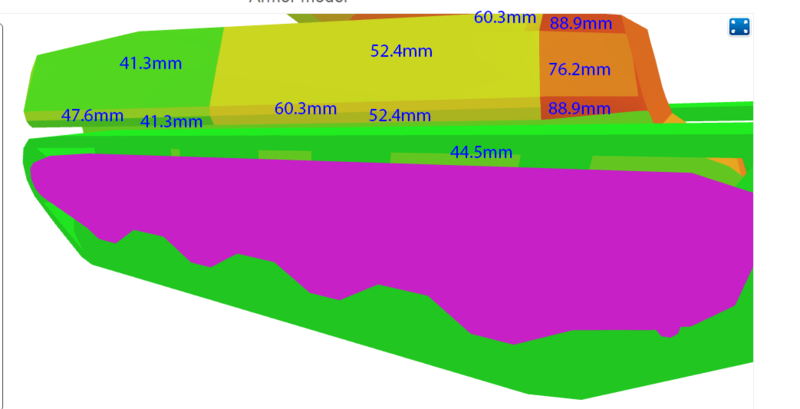 •70° plate from rounded area to hull floor is 44.5mm (-25.5mm). •Rear hull is 46mm, with 25.4mm near the bottom (was 41mm). •Roof no longer autopenned by 76mm guns. •Top turret has changes similar to the stock turret. •Top turret has no bump to uparmor, but there is a 82.6mm cupola now. •Top turret has two new bumps near the edge on either side of the gun mount. •Look at this picture for the side hull. Side hull was just a solid 44mm, shoulders 83mm. •UFP is now 46° instead of 48°, LFP 55° instead of 45°. •Top turret front slope is closer to 30° now than 20°. T28 Prototype•You get a roof! It’s 38.1mm thick. •You get cupolas too. Flat parts are 190.5mm, sloped is 152.4mm@50°. •Bump on turret side to fit cupola is 165.1mm. •Turret ring front is 203.2mm (+50.8mm). •Turret sides near the front are 139.7mm (+12.7mm). •Mantlet is now 203.2mm (+70.2mm). •Hole behind mantlet is larger and less covered by the gun. •Sloped things on front hull with tracks are 147mm (+20mm). •Hull MG weakspot no longer has little bump in the middle. Verdict: Frontal turret side buffs are going to be really nice if the angles aren’t different. I hated the tank too much to decide on the other stuff. Verdict: Like the Crusader, this lost its front autobounce plate against most guns (still will bounce up to a 23mm autogun). Lack of a sled and more hollow tracks also make it slightly worse. IS-6•Turret slopes on front and side noticeable better. •Small 150mm spot on turret roof for a periscope removed. •Spare tracks on rear hull add a 80mm zone (+20mm). •UFP angle changed from 64°-69° to 65°. •LFP angle buffed from 51° to 53° and side hull from 44° to 46°. •Lower edge of sloped side hull now slopes down at 43° with sideskirts over it. Verdict: Russians thought the first HD model wasn’t good enough, so they threw in a couple more buffs. Mantlet is now invincible too. Only nerf is that little area at the bottom of the UFP that was 69°, but is 65° now. That area has a bit more 120mm armor on it now at least.